The users can own their own channel on YouTube.Using this YouTube Channel, the users can promote their products/services.The users have the option to own channels on varied subjects whether it is education, music, training, yoga etc. Ownership of channel can once again be any one or combination of paid, owned or earned. YouTube Marketing complete guide is given here. It is the distribution pipeline promoted by the marketer. 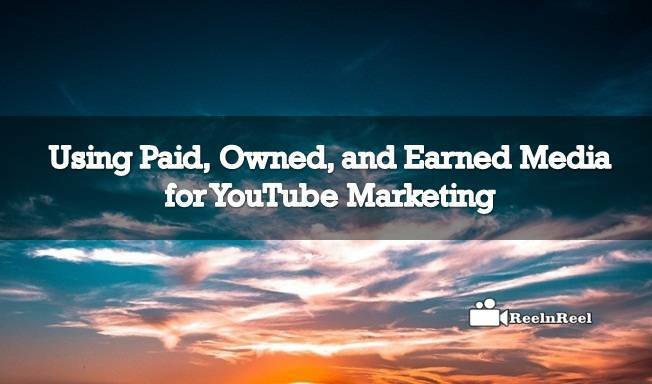 He can use this as his primary place for promotion his videos, and he can also add playlists, in-video programming, and branded intros as well. YouTube was able to change the owned media constantly.To be the very successful owner of YouTube Channel markets need to have the great content about his products/services.Here the marketer has to do a lot of research about his targeted customers.it is a continuous process as the desires and wishes list of customers is ever changing.Advantages of own channel enable you to control your website, and you can efficiently use your media, you can use annotations and info cards etc. Earned media is when customers become the channel themselves and are the result of well-executed owned and paid media.Earned media is also known as free media. Earned media cannot buy or own, and it can only gain organically.The advantage of earned media is that it is the most cost-effective method of marketing.As such earned media is gaining popularity and many companies/marketers are opting for the same. This is even suitable for small businesses trying to make their presence felt online. Paid media can be either commercial (also called in-stream) or on display.Here people are shown an ad (from the marketer) either at the beginning of search results or in one corner – preferably on the right side of the page.The viewer has the option to either view or rejects the same.This gives the marketer an estimate of the behaviour of viewers about his content.Paid media is inviting (by the marketer) the people to watch his content through ads. What is the Best Media? Despite the fact that YouTube is offering its users many options – to own/earn/pay for the channel, each of the options come with their advantages and limitations. After all the discussion as above, it is too difficult to decide which one is the best method of channel promotion and as such the marketers have to tailor-make the promotion of channel.Constant review of his spending, as well as results, is required. Further, it is also necessary that the content that is promoted on the media needs to be continuously updated to meet the changing requirements of the customers.